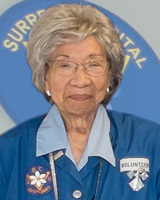 Surrey Memorial Hospital Auxiliary is a diverse group of enthusiastic and dedicated volunteers who work together to enhance the patient experience at Surrey Memorial Hospital. The one thing we all have in common is that we care about our community. Our goal is to make any stay at Surrey Memorial more comfortable. 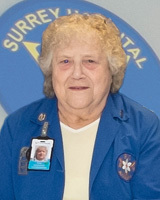 Betty joined SMH Auxiliary in 1991 after retiring from a 44-year career in nursing. She graduated from Victoria High School and received her RN degree from St. Joseph Hospital School of Nursing. Widowed, Betty has three children and seven grandchildren. 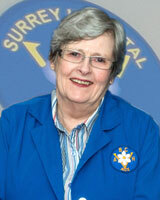 She took over the SMH Auxiliary presidency in August 2012 and has enjoyed all aspects of volunteering. Recently, Betty raised over $3,000 for the SMH Foundation at her 88th birthday party. Guests gave donations in lieu of gifts. Tannis has enjoyed volunteering for the Auxiliary since 2009 after retiring from 15-years in the Human Resources field including a 10-year banking career and 5-years with the Toxicology Department of the Coroners Service. She has lived and volunteered in the community for many years. Tannis is married with three daughters, and two grandchildren. She became the 1st Vice President in 2012. 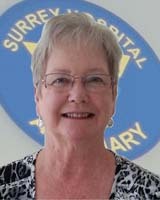 Her time is spent volunteering her time to the SMHA Lottery Booth and as Convener of the SMHA Penny Savers’ Thrift Store. 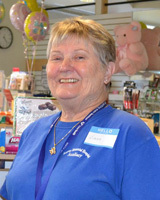 Since Bev joined the Auxiliary in 2008, she has been enjoying her volunteer efforts in the Gift Shop at Care Life Fleetwood. Bev is indispensible at Wellworth’s, the little shop known as “The-Get-Together” spot, and can often be seen making customers laugh and smile. Elsie spent her first 10 years after joining the SMH Auxiliary in 1998, working at the Penny Savers’ Thrift Shop. She is now a member of the Auxiliary Executive & Council. Elsie has worked in many areas such as on the Grant Applications Review Committee, as a Christmas Decorating Judge and as part of the team working in the Auxiliary’s Office assisting our administrative Assistant when called upon. “My time served has been very rewarding. Satisfaction comes from doing a good job or being told that I have done so.” Says Elsie. Armarjit joined the Auxiliary in 2005 and has been an active volunteer having held the executive positions of 2nd Vice President (2007-2009), 1st Vice President (2009-2011) and Past President (2013-2014). Amarjit arrived in Canada in 1972 where he married and had three children. 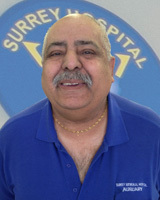 He worked in Williams Lake until 1979 and became a paramedic for BC Ambulance in 1979, retiring in 1999. 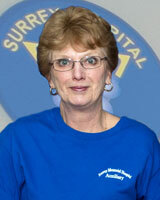 Loretta has been volunteering with the Auxiliary since 2001. Having moved to Surrey in 1960 from Vancouver, the hospital has played an important part in the lives of her family over the years. All five of her children and herself have been hospitalized at one time or another for various ailments. When Loretta retired she decided that it was time to pay back the community. 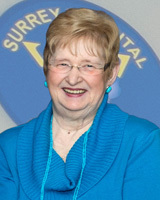 To show her appreciation to both Surrey and the good health of her family, Loretta chose to serve Surrey Memorial Hospital. It has been a very rewarding decision. Roberta joined the SMH Auxiliary in 2001 after closing her ladies wear consignment store that she owned and operated for six years. One of her customers recruited her for the new gift shop opening at the time. Right away, Roberta became one of the buyers, and a few years later became co-convener. Born in Chilliwack, B.C., together with her husband of 45 years they raised three sons in Delta and has been blessed with three grandsons.“Managing and shopping for the Gift Shop has been both a challenge and a great pleasure,” shares Roberta. 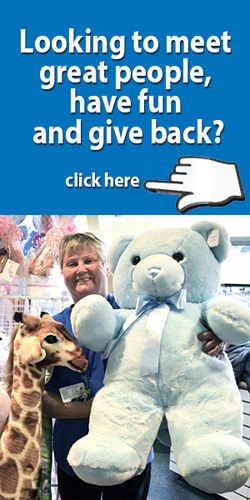 Tannis became the convener of the Penny Savers’ Thrift Shop in February 2013 and she has been enjoying the rewards of this volunteer position ever since. Friendship and a sense of community are top of the list. The volunteers in this Shop are some of the most dedicated, kind and caring people who always give 100%. “It’s a place everyone should work. I have learned so much in this past year and continue to learn every day,” says Tannis. 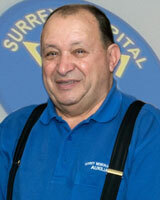 Tony has enjoyed volunteering for the Surrey Memorial Hospital Auxiliary since 2002. Since 2011 his main responsibility has been to work at and coordinate the Lottery Booth Terminal. He also trains other volunteers to staff the Booth. Tony also steps in whenever anything else is required. He is married with 2 children.